For the Bulls, next time comes Monday at the United Center. Though the Bulls will have to be a lot better if they hope to even the season series because the only reason they lost Friday was because they were not the better team. “I’m excited to play them again in a couple of days,” said Joakim Noah, who had 12 points, 13 rebounds, six assists and four steals. Jimmy Butler and D.J. Augustin led the Bulls with 17 points each while Butler added five steals. Mike Dunleavy set a career-high with five blocks. Luis Scola with a season-high 19 points off the bench led Indiana. Paul George had a triple-double with 10 points, 12 rebounds and 10 assists while shooting three of 13 going against Butler. This was probably the more important game for the Pacers, who had lost five of their last nine and were being questioned even at home as perhaps not the team they believed they were, the team with the best record in the Eastern Conference. The Pacers came out tougher and more aggressive than the Bulls and made their point, at least for one night, that at 51-18 you’ve got to come through them. The Bulls, outrebounded 51-36, with 10 fewer assists and shooting 36.4 percent, fell to 38-31. “We didn’t rebound; we weren’t tough enough. You’ve got to be tough,” said Thibodeau in a message he doesn’t often have to deliver to his team. The Pacers came out and pushed the Bulls around and the Bulls became frustrated with Taj Gibson fouling out in 22 minutes with seven points and five rebounds. It was, of course, much more than a tough whistle from the officials. The Pacers’ size seemed to overwhelm the Bulls with Roy Hibbert getting 11 rebounds and Ian Mahinmi giving the Bulls trouble at the rim as the Bulls missed numerous close in attempts. But the Bulls defense repeatedly broke down despite Butler playing George so well and David West having little impact. The Pacers’ bench had 34 points led by Scola as the Pacers constantly got open shots off the Bulls pick and roll defense, which doesn’t happen often. A big man like Gibson is supposed to help as the pick and roll is routinely pushed to the baseline and outside the paint. But as the big man helps on the penetration, there is supposed to be a stunt or help toward the shooter or roll man. It too frequently came late or not at all, uncharacteristic for the Bulls on defense. D.J. 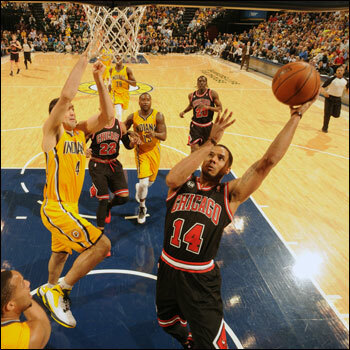 Augustin scored 17 for the Bulls, who will meet the Pacers again on Monday at the United Center. It suggested that failure to be ready that Thibodeau often talks about or just being outplayed, which seemed the answer Friday. The Bulls will get the rare quick turnaround to do so, though they have a home game with the streaking (23 losses in a row) Philadelphia 76ers Saturday at the United Center. Then it’s the Pacers at the United Center Monday. And though teams don’t like to admit to so-called statement games or measuring stick moments in March, it’s now the Bulls turn to prove what the Pacers did Friday, that they can be the tougher, stronger and better team with a message to send. The Pacers now hold a 2-1 edge over the Bulls this season with that one game remaining Monday. The playoffs are now less than a month away. The Bulls would have to get through a first round series to potentially play the Pacers in a series. Now the Bulls are fourth in the Eastern Conference with a potential first round matchup with Brooklyn. Though that could easily change as the three through six teams are separated by just two and a half games. But if the Bulls remain in the four/five first round position and win the series, they’d likely face the Pacers in the second round. Can you consider yourself with a chance to win that series if you were just swept by that team in a four-day period? The Pacers were looking at that question coming into Friday. And they answered it impressively in basically leading the entire second half after the Bulls scored the first basket of the second half and then Indiana scored the next 19 points. The Bulls would get within eight points early in the fourth quarter. But they would not get any closer as the same breakdowns continued. Gibson or Noah would go to help and there would be no support–forget that defense on a string thing. And then after Gibson fouled out with 7:07 remaining, the Bulls failed to get back in transition following a Carlos Boozer miss and Scola got a layup for an 83-71 lead with 6:28 left. The Bulls wouldn’t get any closer. The Bulls did get off to a good start in what was shaping up to be the sort of tough, physical, back and forth game down to the end that these should be the way the teams are built similarly. But each one this season has been a double digit margin as the Pacers with Derrick Rose and Luol Deng playing back in November beat the Bulls by 17 in Indianapolis and then lost 10 days later at the United Center by 16. The Bulls seemed ready with active hands, Dunleavy with a pair of blocks as he got Hibbert from behind once. The Bulls had a combined eight blocks and steals in the first quarter in leading 23-19 on a late Butler three. The Bulls would waste a Butler four of six shooting game on threes. Once midway through the first quarter, Kirk Hinrich drove hard and scored, falling out of bounds and to the floor on top of the courtside photographers. The Bulls bench players were up screaming for him to get up and back on defense. 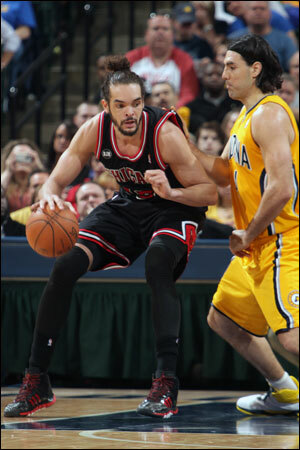 The Bulls understood what a win in Indianapolis could mean against the stumbling Pacers. The Bulls hadn’t been surrendering much going to the reserves to open the second quarter. But this time they came up empty, an 8-0 Indiana run for a 27-23 lead. The Bulls would regroup when the starters returned even as teams have been anticipating Noah’s interior bounce passes. Noah committed three more turnovers, but the Bulls got back within 44-43 at halftime. “We got off to a great start,” said Thibodeau. “When we break the lineup, those guys have got to be ready; they’ve got to get it done. The rebounding was a big concern. We’ve got to correct that. You’re not going to win on the road without rebounding. It was a dominant Pacers stretch to open the second half with the Bulls committing turnovers two of the first three possessions, then settling for jump shots and the Pacers hot. Boozer was a little hot as well and picked up a flagrant foul for an arm bar on Hibbert, and then Lance Stephenson after a driving score stood over Mike Dunleavy in a menacing pose and received a technical foul. That seemed to energize the Bulls some as they scored nine of the next 13 points and a 24-14 run into the first three minutes of the fourth quarter. But the Pacers forced several tough shots and converted to keep the Bulls from making any serious move the rest of the way. “I think we did remind ourselves of who we are tonight,” said Pacers coach Frank Vogel. That much better than the Bulls?